The entrance to the Grand Moque. Driving through Muscat on our first night I noticed a huge, lit-up structure, impossible to miss from any angle—even from the sky (I could see it from the airplane as well). 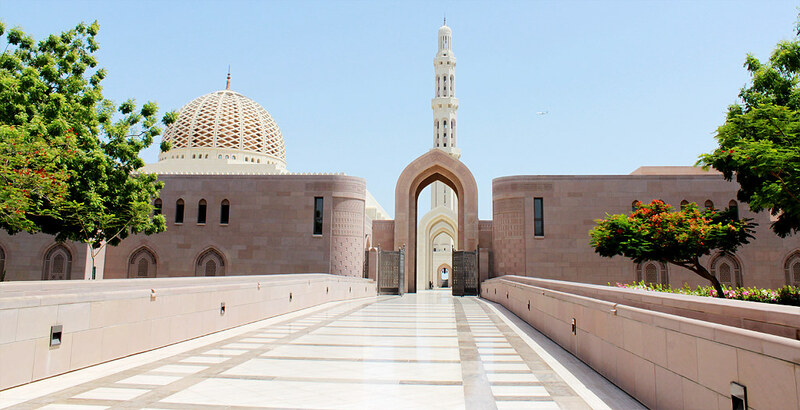 This was the Sultan Qaboos Grand Mosque, ordered to be built in 1992 by then-and-current Sultan of Oman, Qaboos bin Said Al Said. Building started in 1995, and in 2001, only six years later, this impressive structure was completed. So of course, on Monday morning, we hopped on a baisa bus (an inexpensive transportation service named after Oman’s smallest denomination of currency, the baisa) to begin our trip by visiting this beautiful house of worship. 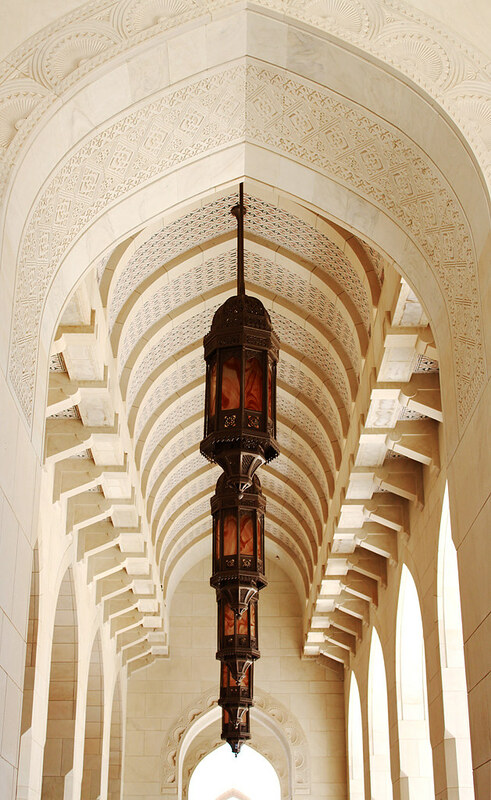 Our tour guide, Hattem Aal Abdul Salam, told us that the Mosque contains both the largest carpet and the largest chandelier in the world (which must be a disputable claim, because the tour guide at the Sheikh Zayed Grand Mosque in Abu Dhabi said the same thing). The men’s prayer hall, home to the world’s largest carpet. 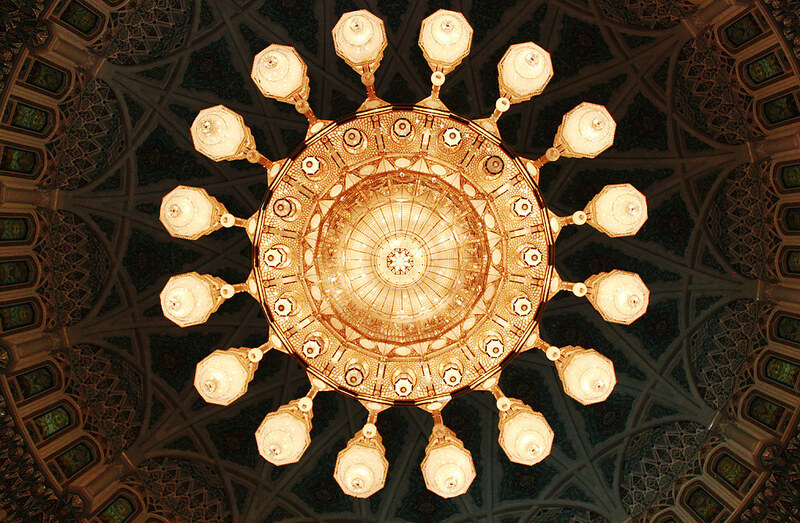 A view from directly underneath the beautiful chandelier. 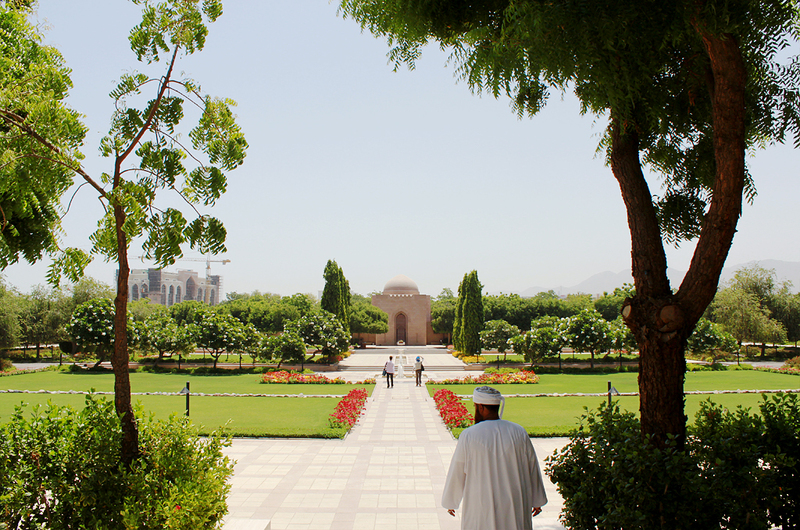 According to Maggie, the upkeep of the grounds is pretty typical of the Sultan’s opinion of the upkeep of Oman as a whole: it must be outwardly manicured, well-kept, and pleasing to the eye. The mosque was certainly well-kept—it was virtually spotless, despite the fact that Muslims visit five times a day to pray there, and literally thousands arrive every Friday afternoon for jumu’a prayers (Friday is to Islam what Saturday is to Judaism and Sunday to Christianity). The mihrab, a part of the wall in a mosque that indicates the qibla, the direction in which worshippers pray so that they are facing the Kaaba. The gardens. Nature is central to Islam, in which artists are discouraged from drawing animals or people, so gardens are an important part of the beauty of the Mosque. 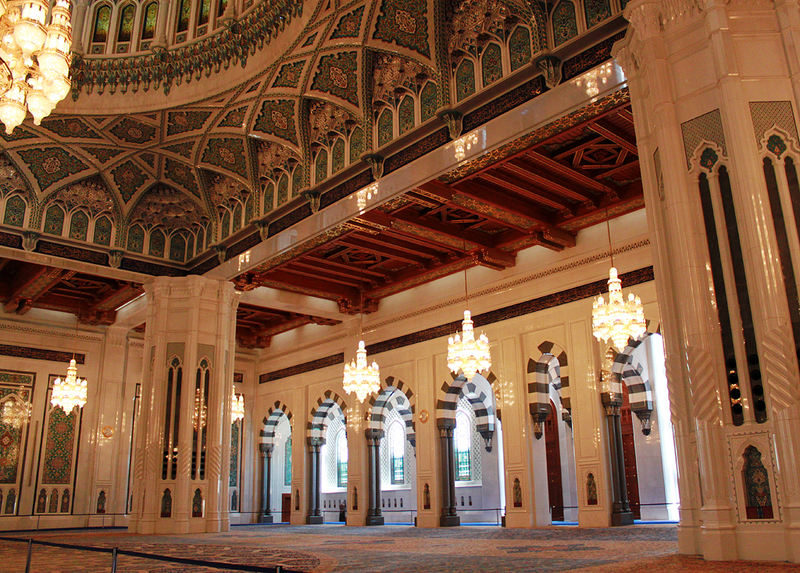 Important note: the large, central prayer room—with the huge chandelier and carpet—is the prayer room for men only. 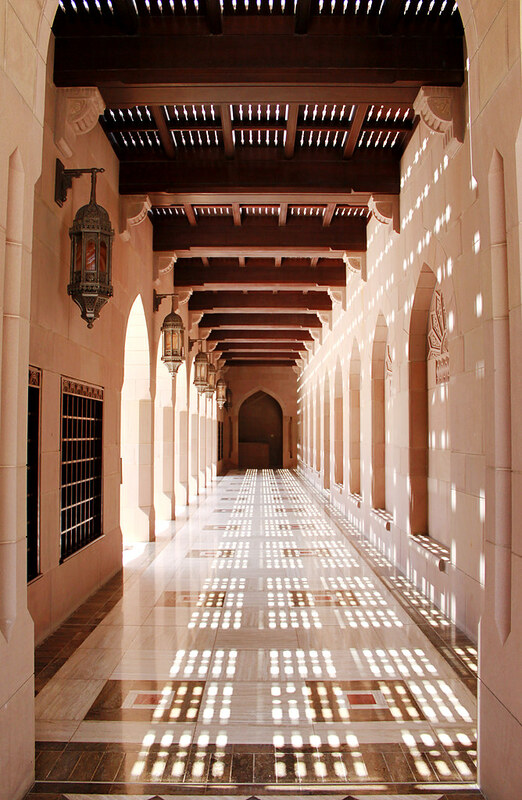 Women are free to enter and visit, but there is a separate prayer room for females; it is equally beautiful, though much smaller and not quite as grand. Every mosque that I know of is like this—the separation stems from the religion itself, which cherishes modesty. You go to the mosque to pray, and, as many religious figures have expressed, having men and women in the same room encourages looking at each other—or actually mingling—which removes the focus from worship. Thus, segregation. Personally, I do think the concerns behind these procedures are valid—in any country, teenage boys and girls (for example) in the same room would cause wandering eyes, I’m sure. The problem is when separate but equal doesn’t actually yield equality. The boys take a photo with Hattem in the smaller women’s prayer hall. The fact that the women’s room is smaller is actually a practical development: in many parts of the world, women spend less time in public than men, meaning there are less women praying outside of the home (at the mosque). Unfortunately, as this dynamic has changed—in America, especially—the size of the prayer halls has not. It differs depending on how nice or large the entire mosque is (and “nice” or “large” they usually aren’t, given how hard it has become to build a mosque in America). But, increasingly large numbers of women and their children are relegated to pray in small areas that are too crowded or just not well-kept, causing some to speak out. I personally have no idea whether or to what extent this is a problem outside of the U.S. (or beyond the Western Wall in Jerusalem), but seeing women’s prayer areas, as a female worshipper, always prompts me to think about these issues. 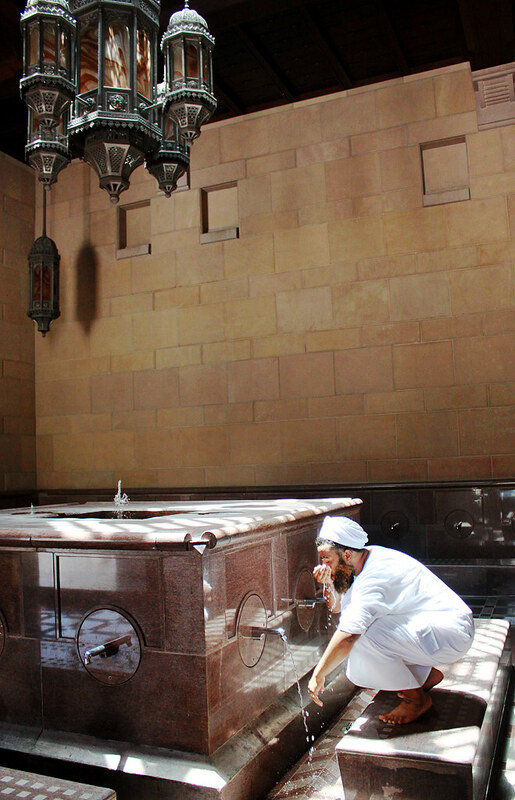 The final part of our tour brought us to the special area in the Mosque where Muslims can perform wudu (ablution), the Islamic ritual for washing the body before prayer. Hattem showed us how wudu is done, washing his hands, face, arms, head, and feet. 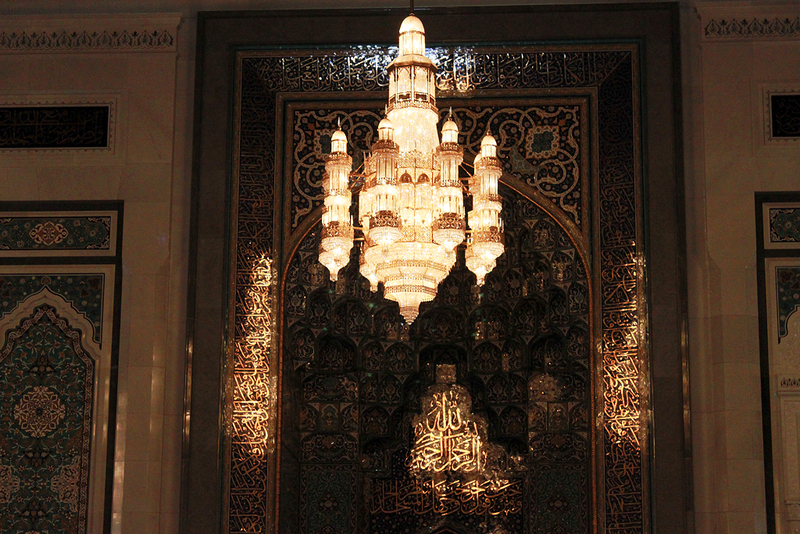 For some reason, this was my favorite part of the mosque. I don’t know if it was the sun peeking through the roof and giving everything a holy glow, or perhaps the quiet echo of the water as Hattem cleansed himself before God. Or maybe it’s because I’ve only ever performed wudu (or wuzu, as Urdu-speakers pronounce it) in my bathroom sink, which isn’t quite as serene. But even just looking at the photos I’m reminded of a raw feeling that I didn’t experience in the spacious prayer halls or grand exterior. Strange, I suppose. 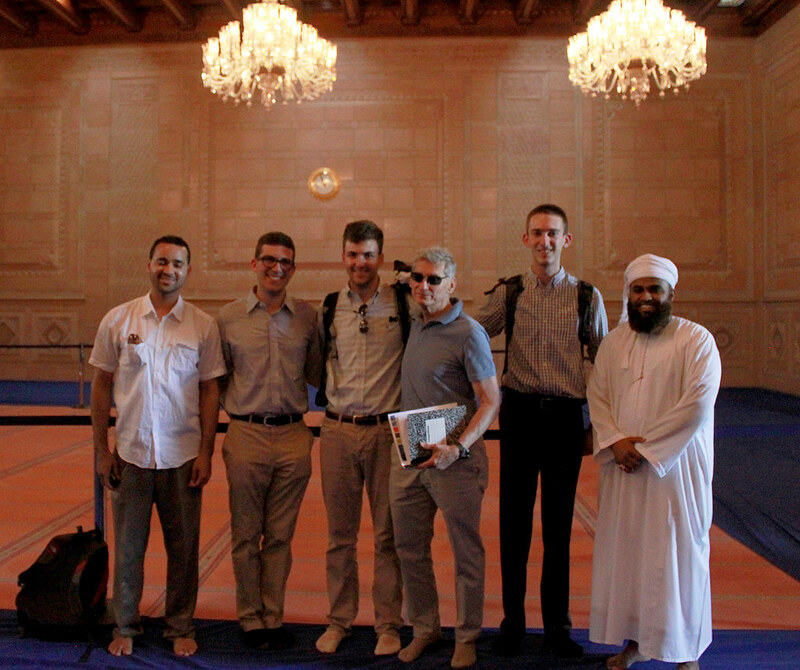 After completing our tour, we were escorted into a small room at the mosque that is the Islamic Information Center. Here, a volunteer named Hafidh talked to us about Islam as a religion in Oman and rest of the world. I honestly enjoyed the conversation, which is pretty telling in itself—I already know the basics and more of the religion, and I wouldn’t have been interested in hearing someone just talk about the religion plainly. You know, just being told what it is and how it’s actually peaceful and whatever I learned in Sunday school or could easily tell anyone else myself—which was the case at least twice on this trip. 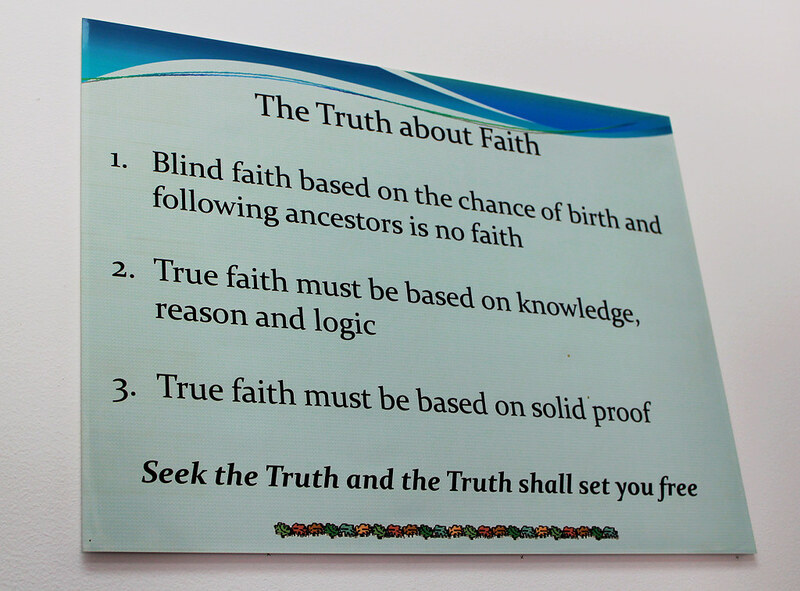 But Hafidh was knowledgeable and insightful and, after laying down the basics of the religion, he helped us learn things I actually did not know before. He told us there are two sources of law in Islam: the Qur’an and the Prophet—namely, the traditions based on his actions and words as recorded by his disciples. And Oman is an Islamic country, but with both civic and Islamic law—the Ministry of Religious Affairs deals with family issues, inheritance, etc. while other governance is civic. There are also both Islamic and civic courts. In the past, there used to be an Imam elected by the people democratically, and he was the ruler of Oman; now, there is a Mufti, the top religious scholar, who is chosen by the government and is not a leader like the Imam was. As for the religion of Islam itself, within the huge division we know exists (Sunni vs. Shi’a) there are further distinctions. There are actually four Sunni schools of thought; the original scholars didn’t intend to create sects, but people used their names to distinguish their interpretations (e.g. “Wahhab”-ism), and thus new divides were born. 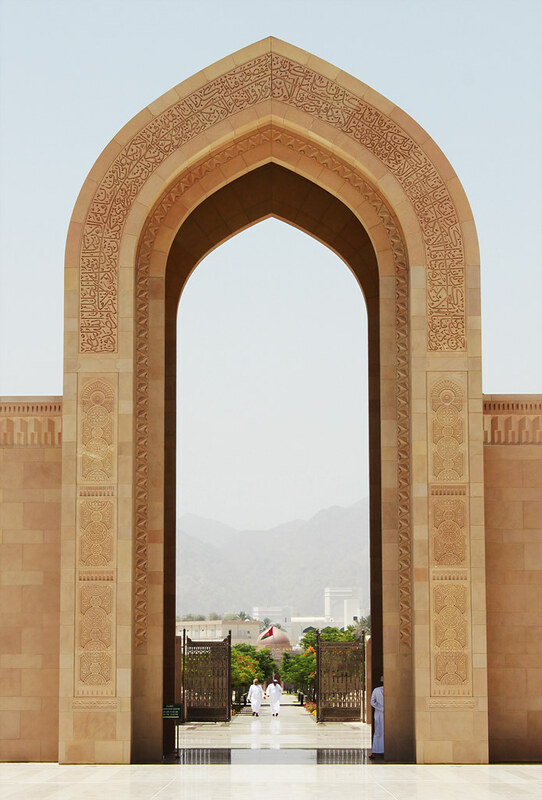 Oman is the only country that is majority Ibadi—which is neither Sunni nor Shi’a—but it contains people of various Islamic sects, and other religions as well. The formation of Shi’a Islam is different from the internal divides of Sunni Islam, however. The issue here is historical events, where one group (Sunni) believed the Prophet’s uncle Abu Bakr should succeed him, and the other group (Shi’a) believed his cousin Ali was the rightful successor. 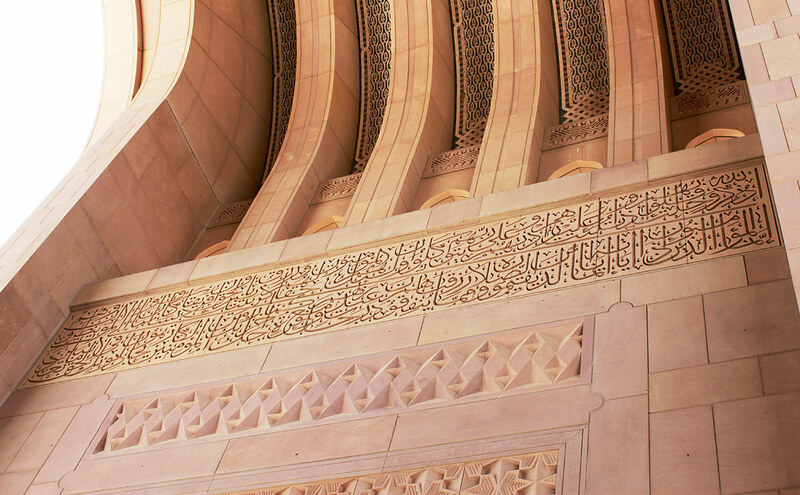 Jesus is an important figure in Islam, but seeing his words on a pedestal in the Mosque epitomized the culture of tolerance that exists in the country of Oman. As Hafidh reminded us, the Qur’an explicitly says “There is no compulsion in religion” (2:256)—no one can “force” faith in anybody, and “God never said other people living must be Muslim”—it’s about your own accountability. Also, he told us, you need knowledge to make a decision about “which of God’s wills to follow.” Even in the first verse of the Qur’an, the first thing Angel Gabriel (Jibril in Arabic) tells the prophet is to “read”—not anything else. In Hafidh’s interpretation of Islam, knowledge and personal choice is central, and I appreciated that. Overwhelmed by the compassionate picture he painted, we asked Hafidh why Islam is so misunderstood. He said that Islam has become the “scapegoat of the media,” with rampant sensationalism used to sell news. And when the media destroys the name of Islam, he believes we must thus use the media to “set things right” and “show truth.” In a way, it is “our fault”—the fault of fellow Muslims—that this has happened, because we’ve stepped back and let others speak louder. Small groups who think they represent Islam have their own “local and political agendas,” and the media will display them as “the” Islam, but really they are just their own specific group. And there are “billions of Muslims” in the world, he reminded us, but a very small percentage of them is extremist—so really, Islam is not any more prone to extremism than are other religions. I think his analysis is spot on. The last thing we spoke about was the Israeli-Palestinian conflict (of course, our Israel-obsessed group had a knack for relating the issue even to a country which seems relatively removed from it). First, Hafidh made the point that Jews and Muslims are both “people of the book,” and Jews just followed the previous scriptures and prophets of God; both groups lived in the Middle East peacefully for centuries, because Muslims viewed Jews as “following a prophet of God.” Furthermore, the conflict is between the state of Israel and other states, not Jews vs. Muslims or Arabs—”it just so happens that they are Jewish.” He specified that not all Jews even support the state as it is; “Jews are equated to Israel, erroneously, the way every Muslim is equated to [pretty much anything].” This is an important and relevant insight. First, because equating all Jewry with Israel is dangerous for obvious reasons, and also because many Jews have stood against Islamophobia as they see its frightening parallels with anti-Semitism. As the conversation ended, Hafidh pointed us to a rack of various books and printed materials about different issues in Islam—from which we were free to take anything we’d like. They even had CDs with translations of the Qur’an into different languages, including Urdu, so I picked up one of these for my mother and grandmother to use. I also picked up a book called “The Twenty-Five Prophets” (there are 25 prophets named in the Qur’an, but Muslims believe that there were many more throughout time, who just were not mentioned). There were also various booklets, as broad as “Islam and Muslims” to specific issues like “Islam and Christianity as seen in The Bible,” “Women in Islam,” and “Why Pork is Prohibited.” The ones I named are the ones that caught my interest, which I was able to bring home with me. After browsing the materials and saying our goodbyes, the group headed off for a lunch occasion the likes of which we could never have expected and will now never forget.